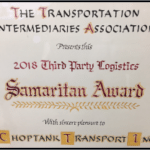 Choptank Transport is proud to announce it has been named the 2018 recipient of the Transportation Intermediaries Association (TIA)’s Samaritan Award. This tribute recognizes a TIA member for exceptional service and assistance to others in need. The purpose of the award is to recognize the philanthropy that exists in the 3PL industry by spotlighting an extraordinary 3PL each year. This year’s Award was presented at the TIA’s 2018 Capital Ideas Conference & Exhibition on April 10, 2018, at the JW Marriott Desert Springs Resort & Spa in Palm Desert, California. The nominees are reviewed and measured by their activities within their communities, including charitable giving, volunteering logistical services, providing manpower, hiring disabled or veterans, sponsoring local sporting events, supporting those undergoing severe hardships (financial or otherwise), and offering scholarships. 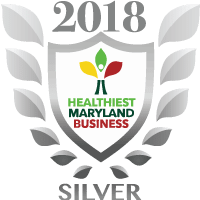 Choptank Transport reports that it has a corporate responsibility to give back to its community. Charitable giving has been a vital thread in the fiber of the company’s culture with organizations such as the Salvation Army and March of Dimes receiving particular attention in the last few years.